Gulf-Side Home Located in the Heart of Beautiful Seagrove Beach!! Experience the charm and serenity of Seagrove Beach. Dolphin Run is a great place to get away from the cares and stresses of life by enjoying the white beaches and crystal clear gulf water. It is also close to everything; restaurants, golf, hiking and biking trails. This three story home comfortably sleeps 12 with a large master king bedroom with a full futon, a second king bedroom, a queen bedroom and the 4th bedroom has twins, also there is a sleeper in the living room for added sleeping space. There is a community pool shared with only 2 other homes and a private beach boardwalk only steps away. * Parking for 4 cars. * Complimentary beach service; 2-chairs/1-umbrella. Available Spring through Fall (weather permitting). Complimentary beach service; 2-chairs/1-umbrella. Available Memorial Day to Labor Day (weather permitting). 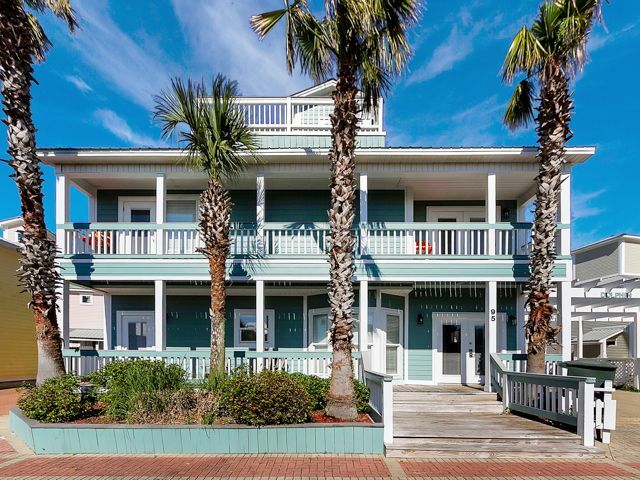 Our family booked this Seagrove Beach rental through Garrett Realty for a fall week at the beach. Garrett Realty was very helpful and accommodating to all of our questions about this rental, and the reservation process through Garrett Realty went very smooth. Dolphin Run was a clean, well maintained home in a gated subdivision, which was safe for children and families walking the short walk to the beach. The beds were comfortable, the bathrooms very clean, and the space is nice for families to spread out. The ice maker did not work upon our arrival, however when we notified Garrett Realty, they sent someone out the next business day. The ice maker could not be fixed, however we bought bags of ice to keep in the refrigerator, and it did not hamper our enjoyment of this rental at Seagrove Beach. We would love to go back and would recommend this rental!